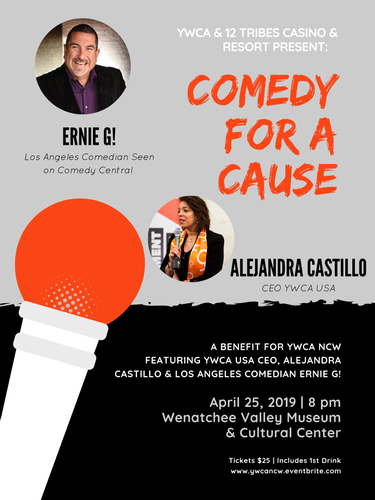 YWCA NCW and 12 Tribes Resort and Casino is slated to host Comedy for a Cause, Featuring Los Angeles comedian Ernie G, previously seen on Comedy Central and HBO! The show will take place on April 25th, at Wenatchee Museum and Cultural Center. Doors open at 7:30pm, Show starts at 8:00pm. Tickets are $25 and can be purchased at www.ywcancw.eventbrite.com. Ticket includes first drink and open seating.